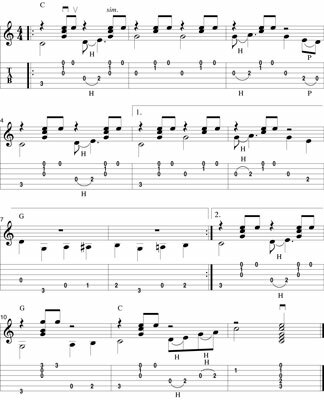 Hammer-ons, pull-offs, and bass runs are an important part of the Carter style of gutiar playing, as you see in this arrangement, loosely based on the traditional song “Gospel Ship.” To play “Gospel Ship” on guitar, you need to know how to play a Carter-style solo; how to play hammer-ons and pull-offs; and whether any person on the planet actually knows the lyrics to this song. Carter style puts the melody in the bass and the accompaniment in the treble. The standard notation helps you determine which notes you play with the thumb (the ones with the stems going down) and which you play with the fingers (the ones with the stems going up). This song works equally well, however, if you use a pick. Try it both ways.